Please enter text desired in correct capitalizaTION. I will copy this. Name (+ birth month for items with birth stones), exact wrist size for bracelets. Finish if an option was not offered (shiny/antiqued/black etc) in a drop down menu. 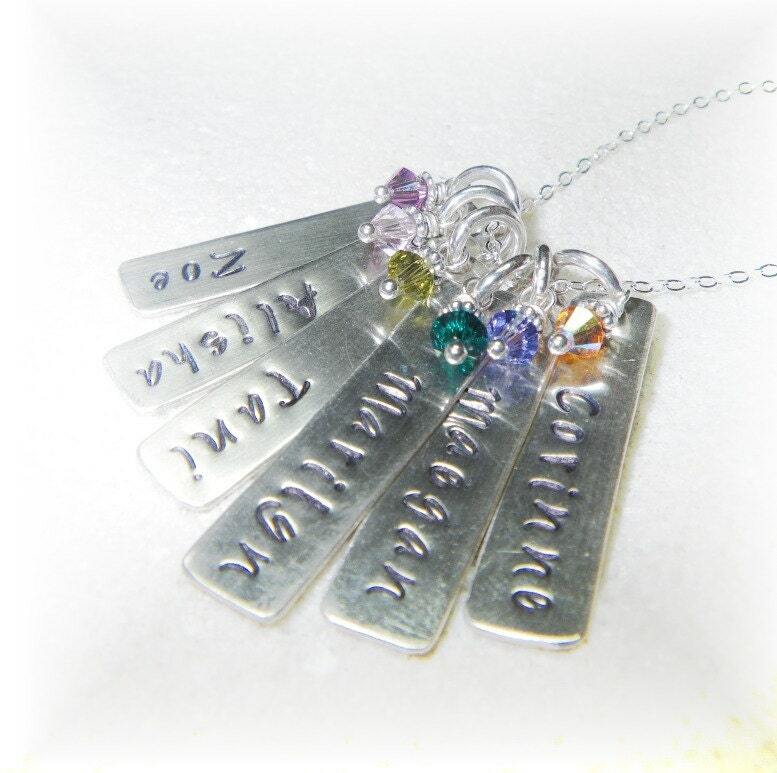 This is the perfect unique silver gift for any mother, mother-to-be, or grandmother: a personalized, handmade necklace with the Swarovski birthstones of children and/or grandchildren! Nice girlfriend gift, too! This is such a fun, bold font without being too immature. Plan ahead for Valentine's Day and Mother's Day and order soon! This particular item includes SIX separate nameplate charms with corresponding Swarovski crystal birthstones (see last pic for crystals) on a petite 16 or 18" sterling silver flat cable chain (sparkly!). All the metal is hand-cut, hand-stamped, and the chain hand-finished in your desired length. I can antique this item for an additional $1.50 (the necklace and/or the charms). Please specify lightly or heavily oxidized if you want to add this. All photos are shown in unoxidized silver. I can also use real birthstones (even real diamonds and genuine opals!). Please contact me for a quote on stones not listed below. I probably have them! You can find the gemstone listing here: https://www.etsy.com/listing/182737382/reserved-real-gemstone-birthstone-charm Just select one at a time and use the drop down menu to select your gemstone before selecting the next stone. Please contact me if you need more than are showing as available. The charms measure 1 1/4" by 5/16". They are rectangular and attached by thick, sturdy sterling rings. Additional charms available for an additional charge each (including birth crystal). Please convo me for a private listing if you don't see your option available in my shop. I will bill you separately via paypal if you include more than sixnames and begin the project once payment is received. The charms are 22-gauge silver and will be tumble-polished for shine and strength and finished with a protective microcrystalline wax coating to preserve the finish. ♥chain length (16 or 18 inches) See my shop for chain upgrades. ♥Font if you prefer other than Bridgette shown in first photo, clearly indicate otherwise. If you type "Colin"Floridian, I will stamp the first letter capital in the floridian font; if you type "colin" aras, I will use all lowers in that font. I will let you know if your selections will not work in the font you have chosen. One photo is a customer pic (thanks, Caitlyn!) to show scale and is a different listing in papyrus font without birthstones. *See last photo, which shows the traditional and Swarovski birthstone equivalents. The natural stones I send may vary a bit from the ones pictured (but will be faceted - colors will vary subtly as well), but will be the genuine article and match the item ordered in shape and scale. The stamping is done individually by hand. Please note that the lettering will not be perfect and will only add to the charm of your one-of-a-kind necklace! ♥My current turnaround time is posted on my main announcement page. Generally less than 10-14 days.